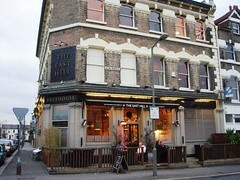 One of the non-Young's pubs in Wandsworth, this is just up the hill from Wandsworth Town Station near bus routes along East Hill (between Clapham Junction and Putney). It is a pleasant, open space with plenty of large solid wooden tables of varying heights, some leather couches, and a dining area with an open fire towards the rear of the pub laid out with knives and forks, glasses and napkins -- though if the rest of the pub is full, they'll let you just drink at the tables. A good selection of newspapers are provided for reading. The clientele tend to be young professionals, and can get a bit noisy in the evenings, but not unpleasantly so. There's additional seating, fairly comfortable, on a patio outside on the (quiet residential) street. There are four real ale handpulls, with Sharp's Doom Bar (of which Ewan had a few very nicely-kept pints) and Adnam's Bitter apparently regulars, with the others changing -- Ewan has spotted Hop Back TEA, St Austell Tribute, Harvey's Best, and Weston's Traditional Scrumpy making appearances. They also have Bitburger lager and Aspall Suffolk Cyder. The food menu is fairly unadventurous but covers all the bases (mains are £9 to £15 for the steak), though the sweet potato chips (£3) from the bar snacks menu were hand-cut and very tasty. They also have a range of tasty Salty Dog crisps behind the bar (though pricy at £1.20). Food is served noon-3pm Monday to Friday, 6:30-10pm Monday to Wednesday, 6:30pm-10:30pm Thursday and Friday, noon-10:30pm Saturday, and noon-4pm and 6:30pm-9pm Sunday. Last visited by Ewan and Jo, 29 June 2009. Food times and prices taken from menu, March 2008. Opening hours taken from Time Out website, April 2008. Last edited 2013-05-10 08:27:29 (version 12; diff). List all versions. Page last edited 2013-05-10 08:27:29 (version 12).